The MISSION HydroActive Cooling Performance Hat is the ultimate headwear for cooling comfort and protection from the sun. Only MISSION has HydroActive technology for instant cool relief from the heat. Dip the hat in water to activate the targeted cooling zones for instant relief that lasts up to 2 hours. To re-activate the cooling zones, simply repeat the steps. The permanent fabric technology is chemical-free and offers UPF 50 sun protection that blocks up to 98% of UV rays. The hat features breathable panels for maximum airflow to keep your head dry and cool. Easy to care for hat is machine washable. To feel the hat start to cool just sweat it, or wet it. Then, fan yourself with it just like you did with your old one...Only this time, when you wear your new lifestyle hat you'll actually feel a cooling difference ? not just hope to. 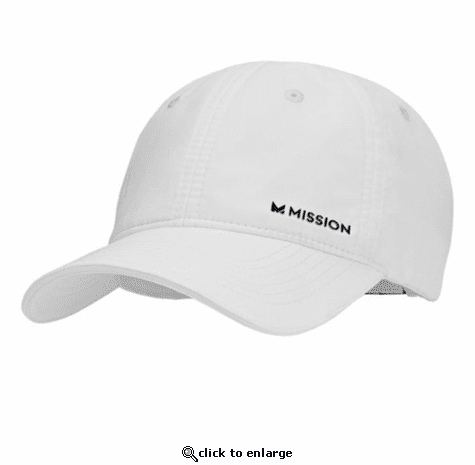 MISSION HydroActive Cooling Performance Hat has long-lasting instant cooling fabric to keep you cool and comfortable in the sun and heat. The perfect accessory to help you stay cool during fitness, outdoor activities, beach, gardening, fishing, golfing or working in the heat. Unstructured crown for a relaxed fit. Velcro adjustable closure. Almost as stylish as a regular logo golf hat, but much more functional.